Offering acupuncture treatment in Scottsdale, Lloyd G. Wright, L.Ac, AP, DNBAO is licensed by the State of Arizona, California, and as an Acupuncture Physician in Florida to practice Acupuncture and Traditional Chinese Herbal Medicine. After receiving a BA in Psychology from San Francisco State University, Lloyd G. Wright, L.Ac., was trained at the American College of Traditional Chinese Medicine, San Francisco, CA, completing his education as an acupuncturist and herbalist in 1985. Since that time, he has offered service through his acupuncture clinic while continuing private training with master acupuncturist and herbalist Dr. Lam Kong. Mr. Wright has further extended his education by earning a Diplomat from the National Board of Acupuncture Orthopedics (NBAO). He served as a Qualified Medical Evaluator (Acupuncture) for Worker’s Compensation injuries in California and is certified to do disability evaluation by the NBAO. He specializes in allergies, influenza, digestive disorders, pain, soft tissue injuries, women’s health including PMS, menopause, and infertility, evaluation of injured workers and has been in full time private practice since 1985. 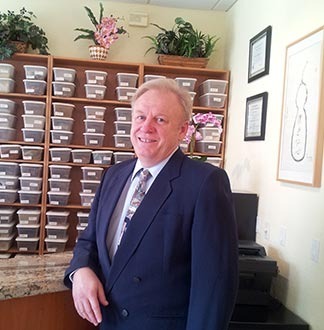 He is an active member of the American Association of Acupuncture and Oriental Medicine (AAAOM), the Arizona Society for Oriental Medicine and Acupuncture, and has been active in the California Certified Acupuncturist Association and the California State Oriental Medicine Association. Additionally, he served the community as one of Governor Wilson’s appointees to the California Acupuncture Board of the State of California. The Board oversees licensing, educational standards, legislation, and enforcement issues for Acupuncturists in the State of California. During his term from 1993 to 1999, his role on the Acupuncture Board has included Vice Chair, Chair of the Exam Committee, and Chair of the Enforcement Committee. In the area of education and research he has also served on a scientific review panel for the National Center for Complementary and Alternative Medicine (NIH) and assisted the Accreditation Commission of Acupuncture and Oriental Medicine (ACAOM) as a site visitor, the California Acupuncture Board, and the California State Council for Private Post-secondary and Vocational Education, with the review of acupuncture schools for State approval. He also assisted the California Industrial Medical Council in writing the examination for Acupuncture Qualified Medical Evaluators, and conducted many Qualified Medical Exams for injured workers. Mr. Wright worked as the Academic Dean of the Rain Star University, College of Acupuncture & Oriental Medicine in Scottsdale, Arizona, overseeing the program and acquisition of candidacy status with the Accreditation Commission for Acupuncture and Oriental Medicine, as recognized by the Department of Education. He also held the position of Dean and taught orthopedic testing for the East West College of Natural Medicine in Sarasota, Florida and is currently in private practice in Scottsdale, AZ.